By Luke Carry | October 15, 2013. Prisoners is a thriller for the modern era. It’s dark subject and ominous tones give it a sense of reality and injection of pace just where it needs it. The opening scene introduces us to god-fearing family man Keller Dover, reciting the Lord’s Prayer as his son takes aim at a young deer. We get a small insight into the family life of the Dovers, littered with Christian symbols and references, before the plot is set in action with the abduction of Keller’s daughter and her friend. The driving force behind this film is the tenacity of Hugh Jackman as Keller, relentless in his quest for his daughter, Jackman’s performance is flawless. Countering this with a quietly obsessive role is Jake Gyllenhaal as Detective Loki. 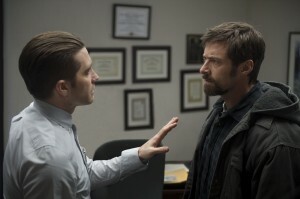 Gyllenhaal gives a solid performance as the chase heats up and the days begin to drag out. With what could have easily been a drawn out film, director Denis Villeneuve handles his plot well, making sure it gathers momentum exactly when it’s needed. While Detective Loki leaves no stone unturned in his pursuit of the girl’s, Keller Dover decides to go his own way, targeting the one known suspect, the driver of an RV who, may or may not have abducted the children. An intricate plot that twists and turns, anchored by the two lead roles, Prisoners is thought provoking in an age where people no longer know their neighbours. All the clichés are handled with ease by Villeneuve, meaning that even the age-old race against time doesn’t feel as dated as it should. While not exactly “fun”, Prisoners is an engaging thrill ride which will leave you guessing up until the last scene.